Top side for glass and pet containers in round, flat, oval, square shaped. We also make tailor made on customer special requirements. We have different kind of following sticker labeling machines. 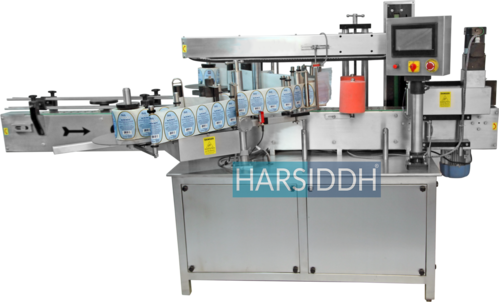 Harsiddh SterilePack (India) Pvt. Ltd. engaged in the business of manufacturing, exporting and supplying Pharmaceutical Machinery. By supplying superlative quality Ampoule Filling Machine, Ampoule Sealing Machine and Ampoule Filling Sealing Machine, we have earned respectable ISO 9001:2015 certification. Our strategic management of infrastructure as per total qualitative management have enabled us to emerge as a prominent organization in this domain. With this advantage, our products range are known for excellent durability, superior finishing, high functionality and low-maintenance aspects. In addition to this, we have managed to gather a vast base of satisfied customers by offering them Sale, Installation and Repairing Service. Our robust infrastructure and the latest technology provide us an edge over other players in manufacturing of high-quality spectrum of machines. Thus, with the aid of our infrastructure system, we are able to fulfill the requisite demands of customers. We supply our products in highly durable packaging utmost sureness of deliverance within calculated time frame. Moreover, we have garnered ourselves wide customer build with respectable clients such as NTP, Ajanta Pharma, Aurobindo, Syngene, GVK, Mylan, Emcure, Dr. Reddys, Bio Tecsi, Piramal Healthcare and Tropics Health.